If you have a Propellerhead Software account, you can currently download Positive Grid’s Bias FX LE guitar amp and effects plugin for free. This features three amps - a ‘77 Silvertone (Clean), ‘69 Plexiglas (Crunch), and ‘92 Treadplate (High Gain) - and six effects. These include Treble Boost, a six-band EQ, the 808 OD stomp box, chorus, and digital delay and reverb pedals. 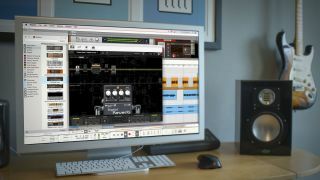 “Since Reason now supports VST plugins, adding BIAS FX to Reason’s rack workflow will give guitar and bass players unlimited tone creativity,” said Jaime Ruchman, Positive Grid Digital Marketing Director. VST plugin support was added to Reason in June 2017 as part of the 9.5 update. Reason 10 was released in October. Bias FX LE is available now on in the Propellerhead Shop and is free for a limited time.